Did you know that, in your natural healthy state, your body is slightly acidic? Everything is either acidic or alkaline, or somewhere in between. You can measure the pH (which stands for potential of hydrogen concentration) of a substance by using the pH scale. Water measures in at a 7.0 on the pH scale. This means that it is neutral, neither acid nor alkaline. Anything above 7.0 is considered alkaline and anything below is considered acidic. Your body has an ideal pH range between 6.0 and 6.8. Values below 6.3 are considered on the acidic side. Values above pH 6.8 are on the alkaline side. Why worry about pH levels? What happens when you are too far in one direction or the other? When your body gets too acidic or too alkaline all sorts of symptoms can begin to plague you. Insomnia, arthritis, low blood pressure, and migraine headaches are all symptoms of acidosis. Nervousness, sore muscles, allergies, and asthma are all symptoms of alkalosis. But that’s not all when your body chemistry is unbalanced, studies have proven that you are at greater risk for getting cancer, diabetes, arthritis, and other serious medical conditions. You can test your pH level yourself by buying some litmus paper. Litmus paper is paper containing dyes that change color when exposed to acids or bases. You can buy litmus paper at most drugstores. Apply saliva and/or urine to the paper. Blue litmus paper will turn red when exposed to acids. Red litmus paper will turn blue when exposed to bases (i.e. alkaline). A neutral pH level will turn a litmus paper purple. It is best to take the test either before eating or at least one hour after a meal. 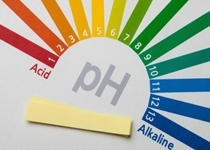 If your pH is too acidic or alkaline, consult with your healthcare provider to get help with balancing your levels. The best way to avoid all the problems caused by acidosis or alkalosis is to make sure that you eat a balance of acid- and alkaline-forming foods. That means eating 80% alkaline-forming foods and 20% acid-forming foods. Most people eat about 60% acid-forming foods and only 40% alkaline foods. It is not difficult to make sure that you are eating enough alkaline foods. Most fruits and vegetables are alkaline-forming. You can go online and look for a list of acid/alkaline foods, or you can talk to your healthcare provider. You may also be able to find a chart in a book in the food and health section of your local library that you can photocopy.